Trivedi Effect workshop is filled with Divine inspirations, insightful commentary, and deep thought-provoking discourses on topics ranging from common life challenges to the development of deeper consciousness, and includes a divine energy transmission. 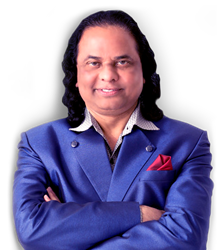 Guruji Mahendra Trivedi is an innovative thought leader offering fresh, insightful, honest perspectives on today’s issues affecting humanity at practical and spiritual levels. Founder of the Trivedi Effect®, Guruji Mahendra Trivedi offers powerful workshops to deepen the participants’ connection to the God of their understanding, as well as, to illuminate the path of awareness and higher consciousness as they learn to navigate and achieve their life’s purpose, fate, and fortune. In a recent Trivedi online workshop, Guruji Mahendra Trivedi, compared man-made laws: Crime (Constitution of Country) versus Divine laws: Sin (Constitution of Divine). His unconventional viewpoint and insight lead to a better understanding between Divine and humanity. The next Trivedi Online Workshop is scheduled at Noon, Pacific Time, Sept. 29, 2018. To register, call 877-493-4092, or register via email at CS(at)TrivediEffect.com. Trivedi addresses innovative and thought-provoking topics at each workshop. Guruji Trivedi tackles the questions that have plagued mankind since its inception such as Free Will vs. Destiny and Life Purpose. In the past, he has even addressed the most common issues affecting humans today including sleep disorders, anxiety, OCD, ADHD, and other issues in the realm of physical, mental, and emotional health in addition to spiritual topics. He breaks down complex topics into the simple basics such as truth, honesty, integrity, trustworthiness and good character. Participants return time and time again to gain a deeper understanding of Divine Grace through a pure lens with no religious or political dogma attached to the messages. Others find answers and “awaken” to their life transformations during the discourses. “Wow! Today’s discourse is so amazing! I have understandings that I have not had before,” said Amber Hall. Each workshop is filled with Divine inspirations, insightful commentary, and deep thought-provoking discourses on topics ranging from human conditioning, physical and mental issues such as sleep disorders, depression, anxiety, and other common life challenges to the development of deeper consciousness, and includes a Divine energy transmission. The Trivedi Effect® has been tested, measured, and validated in over 6,000 scientific experiments globally, by world-renowned scientists and research institutes using the rigor of internationally accepted models of scientific research with the most sophisticated technologies available on this planet. Challenging the known frontiers of science, this research has resulted in over 400 publications in major international peer-reviewed scientific journals with over 4,000 citations.